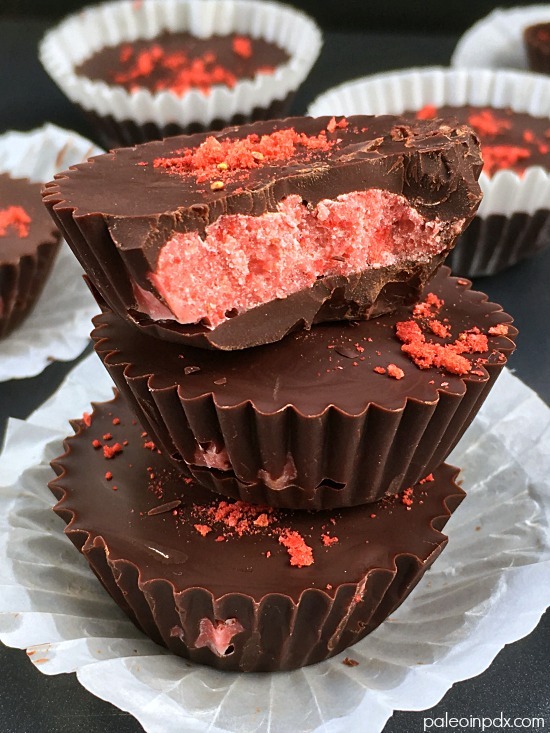 In these strawberry coconut butter cups, melted dark chocolate, coconut butter, and freeze-dried strawberries intertwine to create a decadent, satisfying, and pretty little treat. Can’t beat the touch of pink for Valentine’s Day either! 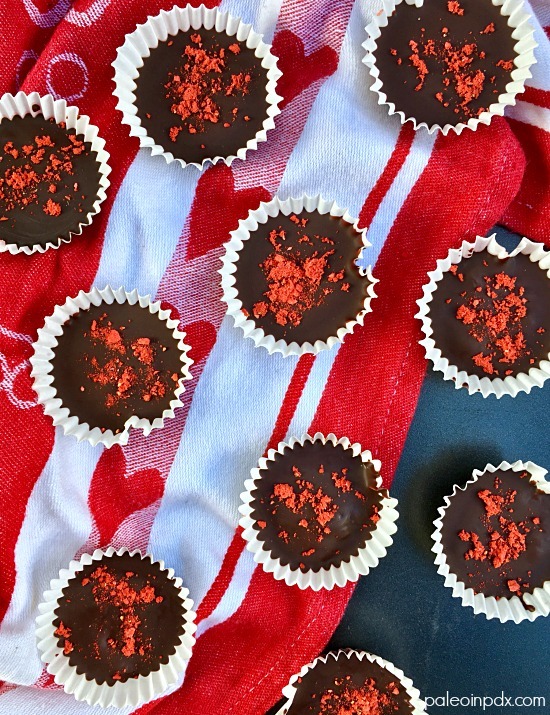 Use your favorite dark chocolate bar and adjust accordingly if you want the cups more or less sweet. Personally, I like really dark chocolate, but know that the darker stuff can be too bitter for some people. Line a mini muffin tin with paper liners and set aside. Melt chocolate in a double boiler over medium-low heat, being careful not to get any moisture in the chocolate. Remove from heat and spoon about 1 tsp of the melted chocolate into each liner. Place muffin tin in the refrigerator for chocolate to set. Meanwhile, place chocolate bowl back over pot of hot water to stay warm over low heat. While chocolate is setting, prepare the filling. In a small bowl, mix together the melted coconut butter and 2 Tbsp of ground freeze-dried strawberries. It will look crumbly, but keep mixing and smushing mixture down with a fork to work in the strawberry powder. Eventually, it smooths out some and is no longer crumbly. Know that it will not be drizzly and melty though. Remove muffin tin from fridge and scoop about 1 tsp worth of coconut mixture into each liner. Flatten mixture slightly with hands or back of spoon. Lastly, remove melted chocolate from heat and top with about 1 tsp more of melted chocolate. Place in fridge to set. After a few minutes or so, while chocolate is still tacky, garnish with extra freeze-dried strawberries, if desired. Place back in fridge to finish setting. Reblogged this on The Backyard Mystic.